Musician Gene Simmons arrives at the Hollywood Palladium, California, in August 2011. A 24-year-old man allegedly linked to the Anonymous "hacktivist" group was arrested Tuesday over a cyber attack on a website run by the frontman of heavy rock group Kiss, the FBI said. A 24-year-old man allegedly linked to the Anonymous "hacktivist" group was arrested Tuesday over a cyber attack on a website run by the frontman of heavy rock group Kiss, the FBI said. 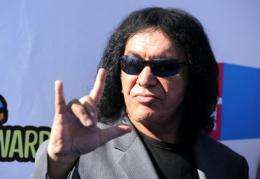 Kevin George Poe, from the northeastern US state of Connecticut, is charged with waging a denial of service attack on GeneSimmons.com, said the Federal Bureau of Investigation (FBI) office in Los Angeles, where he is wanted. Poe -- who used the screen name spydr101 -- made an initial appearance in court in Hartford, Connecticut, where a judge ordered him released on a $10,000 bond, pending his appearance in a federal court in Los Angeles. He faces up to 15 years in jail if convicted over the attack on Simmons, who is famous for the colorful make-up and costumes worn by Kiss, for whom he plays bass and sings. A federal grand jury in Los Angeles returned an indictment last week that accused Poe of being linked with the Anonymous group, a loosely-associated international group that has been involved in scores of hacking exploits. Specifically he was charged on two counts, of conspiracy and unauthorized impairment of a protected computer, over a cyber attack during a five-day period in October 2010. In the attack, Poe and other Anonymous-linked hackers allegedly sent tens of thousands of electronic requests designed to overload the computer server and render the website useless. According to the indictment, Poe used a software tool favored by Anonymous hackers: a Low Orbit Ion Cannon, which can send massive numbers of "packets" or requests in an attempt to overwhelm a target computer. Online media reports have suggested that Simmons has threatened to sue Anonymous over the attack on his website. There was no immediate reply from the musician and entrepreneur's publicist for reaction to Tuesday's arrest. Even Simmons has backed down from the case. But the criminal charges have taken on a life of their own. This is just a SYN attack nothing new, and affecting only one box owned by Gene. There are countermeasures for SYN attacks so this is akin to leaving your doors unlocked and keys in your car. I don't get why Denial of Service gets lumped with regular hacking. It's the computer equivalent of a sit-in protest, temporarily denying access to something, not the same as a break-in or some other crime. and Anonymous attacked Mr. Musical Face Paint ... why? Maybe under the new US laws they can take down PhysOrg, because it has some articles that link to The Pirate Bay... Linking to illegal content is now illegal.